13. i have the mail! i have the mail! delightFUL fans 'n collectors......I love my lovers. DJ John Narucki) 18 min. AMG REVIEW: Although it takes its title from Murray the K's catch phrase from two decades before, 1983's It's What's Happening, Baby! doesn't waste much time in retro nostalgia. 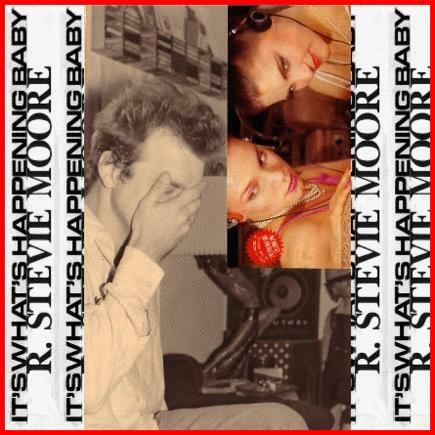 As experimental and largely electronic as most of R. Stevie Moore's other albums from the early '80s, the peak of his artsy new wave period, the 18-track It's What's Happening, Baby! takes the synths, drum machines, drones and dub-influenced rhythm exercises Moore regularly experimented with during this period and pairs them up with some of his trademark catchy pop songs. In the latter category, the folkish, acoustic "I'm Bored" is characteristically wry, "Summons (1979)" is all lo-fi falsetto heartbreak, and "Time Stands Still" and "Without Telling Her" build haunting and compelling songs out of layers of mostly electronic atmospheres. Even the noise collages, like the voice and drum tape loop "You Can't Do It That Way" and the fractured "Nadir 3 and 4," are eminently listenable. Though it doesn't have many well-known songs beyond the cynical "What's the Point?," which would provide the title for Moore's 1984 return to the LP racks, It's What's Happening, Baby! remains a fan favorite.